Thanks to Kiban for this post idea! If you’ve ever seen a picture of the brain, you know the brain is wrinkly. But what’s the purpose of the wrinkles? Because they do have a purpose, and it’s very important. The general rule of thumb is: more neurons = smarter brain. But the size of your brain is limited by your skull. This is where the wrinkles come in. This gets into a concept called surface area, which is usually something geometry nerds talk about, but it’s important for brain nerds too. Surface area simply means the amount of surface something has. If you were to peel off the top layer of something, no matter how wrinkly that something is, and lay that top layer out flat, what you’re looking at is the surface area. More folds = more surface area. That means that a wrinkly brain can hold more neurons than a smooth brain. The wrinkles are so important that scientists even have science-y names for them. 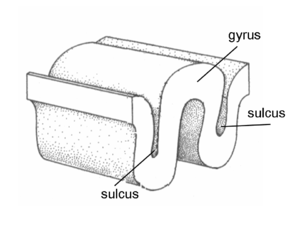 The ridges are gyri (singular: gyrus) and the folds are sulci (singular: sulcus). Even individual wrinkles have names. Neuroscientists talk about the “fusiform gyrus” or the “inferior temporal sulcus”. We have lots of evidence that gyri and sulci are positively linked to intelligence. (Remember, more wrinkles = more neurons.) Human brains are wrinklier than the brains of any other animal. For the most part, we’re all as wrinkly as the next person, but not always. Some people are born with a condition called lissencephaly. This means “smooth brain.” It causes severe mental retardation, and children with lissencephaly often die within several months of birth. We also know that declines in brain function in the elderly are sometimes due to widening of the sulci. A gradual widening of the sulci late in life (which also means a gradual thinning of the gyri), means fewer neurons compared to when a person was young. Some neuroscientists are trying to figure out why this happens, and how to stop it. Extremely interesting. Thank you very informative as well.